When building a new house or remodeling your house, you might come into unpleasant contact with your hammerhead while pounding nails. The pain is excruciating, and at times, you might find yourself unable to continue with the process. Such setbacks can eat into your time a lot. One of the best tools that can help you to avoid these unpleasant encounters is a framing nailer. 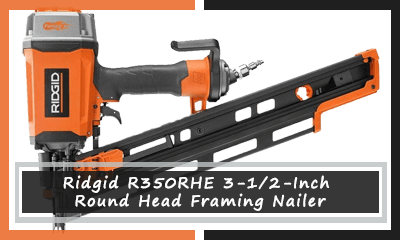 If you cannot stand hammering nails, then finding the best framing nailer is an excellent idea. The main reason why we have prepared this buying guide is to help you in getting the best product. Today the market is saturated with hundreds of models that claim to offer you with the best results. When you think of it, getting a framing nailer seems very easy. However, when you decide to visit your local store or purchase the product online, you are likely to get confused because of the number of models available. This article aims at giving you crucial information that will help you to make an informed decision when it comes to the framing nailer that will fit your demands. 1 What is a framing nailer? 2.1.1 What makes BOSTITCH LPF21PL 21 Nailer unique? 2.2.1 What makes DEWALT DW325PT unique? 2.3.1 What makes Hitachi NR65AK2 unique? 2.4.1 What makes PORTER-CABLE FR350B Nailer Special? 2.5.1 What makes Ridgid R350RHE special? 2.6.1 What makes Paslode 902600 CF325 unique? 2.7.1 What makes Makita AN923 special? 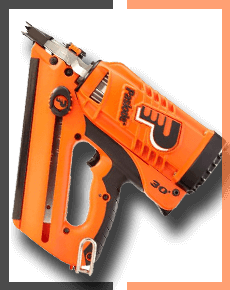 A framing nailer also referred as a framing nail gun is a special airgun that is designed to make the work of the carpenter easier by removing the need of hammer. The nailers are quick to use and will minimize the risk of the carpenter hurting himself while using a hammer. Whether you are an avid DIYer, a professional woodworker or you are in another profession that you find yourself spending a lot of time driving nails with a hammer, it is the high time you consider getting a framing nailer. 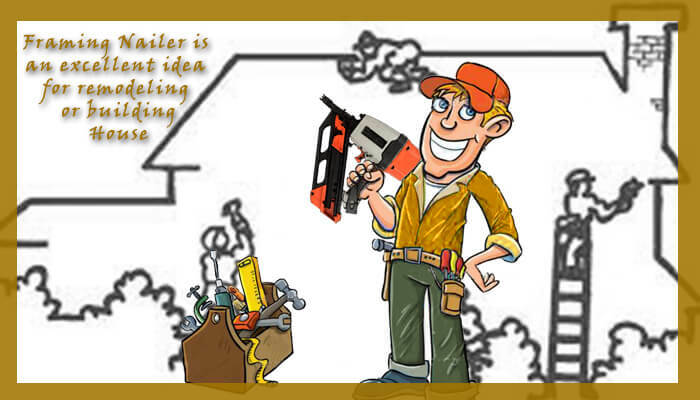 Getting the best framing nailer, will not only save you time but also help you to preserve your energy? Today we are going to recommend the best framing nail guns available on the market. Go through each of these best framing nailer reviews for you to find a model that will meet your needs perfectly. 2 in. to 3-1/2 in. 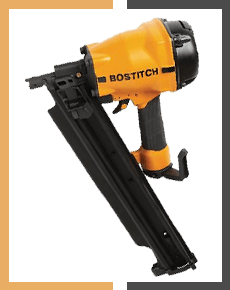 If you are looking for the best nailer to work in tight spaces then, BOSTITCH LPF21PL Framing Nailer may be a perfect choice. This is a small, lightweight tool but is very powerful for doing all types of projects. Another reason why most people prefer this tool is that it comes with tool free adjustment features that ensure the best work quality for the lowest price available. This is an excellent choice especially if you are shopping for a finish nailer. Its compact head and lightweight design allow you to reach any tight space with ease. 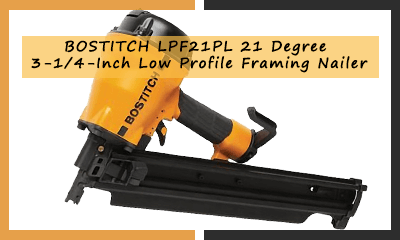 What makes BOSTITCH LPF21PL 21 Nailer unique? A bulky nailer is not only hard to use in tight spaces but makes your hands feel fatigued very easily. This model comes with a small head that allows you to reach the toughest corner. Additionally, this framing nailer is lightweight allowing you to work for many hours without your hands getting fatigued quickly. Another reason why you might consider purchasing this model is that does not need any adjustment tools. You just need to adjust the nailing mode between sequential and bumping firing modes depending on what you are working on. Whenever you want to attach the extra tools, you do not need any extra tool. This model also comes with an air filter that will reduce the chances of getting the tool clogged. The air filter will also prevent the debris and dust from flying keeping you safe. A sleek low profile design. A molded rubber grip for better control. Comes with a hanging hook. DEWALT DW325PT offers you with many quality features and will never compromise on its usability. For this reason, you can use it with much ease even if you have never used a framing nailer before. This is a compact model designed with ergonomics in mind, making it easy to use on large projects without your hands cramping. What makes DEWALT DW325PT unique? Most of remodeling works require a compact framing nailer that has the ability to get into tight spaces easily. DEWALT DW325PT comes in a compact and lightweight design that allows you to work in tight spaces such as cabinets and high places with ease. The model comes with a selectable trigger that will help you to change between sequential and compact modes with a flip of a switch. This makes it easy for inexperienced individuals who have never used a framing nailer before. Another advantage of having this model is that you do not need to purchase any special tools to make any adjustments. You can easily adjust both the rafter hook and the depth of drive with a flip of a stitch. Pretty amazing right? 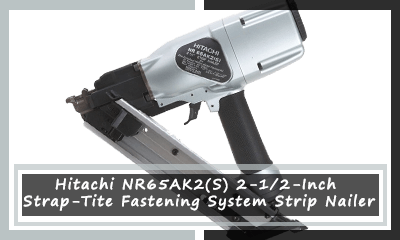 Hitachi NR65AK2 is an air powered framing nail gun that comes with a variety of features making it easy to use. This model is manufactured with the user’s interests in mind making it comfortable and easy to use. This is evidenced by the no-slip elastomeric grip that will fit in your hand perfectly. What makes Hitachi NR65AK2 unique? Although the unit does not come with a carrying case, this model is made with several protective features that keep it from wear and tear damage. These features include a carbon steel toenail that enhances precision and a hardened claw tip that will protect the nose of the gun. Some framing nail guns models do not come with a depth adjustment controls. Even if they do, the adjustment requires the user to use a special tool to do the adjustments. However, with this tool, you can make the adjustments by just using your hands. No separate tools are needed. This unit has a weight of 5.7 lbs and an ergonomic design that makes it well balanced. This makes easy to use for extended periods. Does not require tools to make adjustments. Come with several safety features that keep both the machine and user safe. Does not have a carrying case. 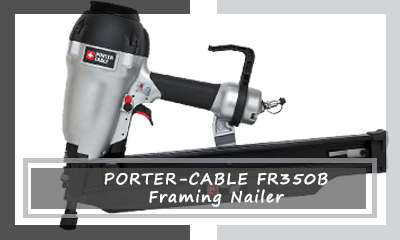 The PORTER-CABLE FR350B framing nailer is a good mid priced model that is not only easy to use but will also get the job done without taking too much of your remodeling budget. The model comes with excellent features that boost its precision while remaining comfortable in your hand. If you are looking for a solid tool to use in your remodeling work, then this might be a good choice. 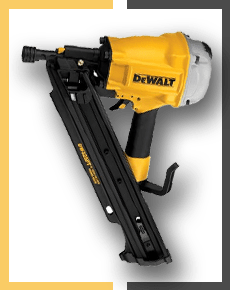 What makes PORTER-CABLE FR350B Nailer Special? One of the features that can make any power tool difficult to use is an uncomfortable handle. This unit comes with an over-molded grip that absorbs the shocks while providing you with a firm grip. Unlike other models that have the ability to drive a 2-inch nail, this model will help you to drive nails up to 3.5 inches. This means you can use it in simple and demanding framing applications with ease. This model also comes with selectable trigger and impact drive modes that will help you in completing difficult tasks efficiently. Besides these features, this it comes with a tool-free adjustable depth of drive that will help you to set the nail heads properly. Additionally, the selectable trigger has a trigger lockout that allows for restrictive as well as contact actuation mode. 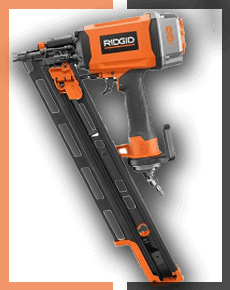 To make the unit durable and lightweight at the same time, Ridgid R350RHE model comes with magnesium housing. This makes it lighter than other models on the market while offering the user with a service they can depend on for many years to come. This is a great choice for homeowners who are looking for speed and power on a budget. What makes Ridgid R350RHE special? This unit comes with an improved design, which is 22 percent more compact and 16 percent lighter than its predecessor is. Its full strike drive system will also give you maximum power output in a compact size. Another great feature that comes with this model is the powerful motor that has the ability to drive up to 3.5 inches nails with ease. Additionally, this model has an improved rear loading magazine system that has a bypass pusher that allows for a quick two-step reloading. This will save you a lot of time and energy while reloading your unit. As previously mentioned this model comes with magnesium housing, which is not only lightweight but also very durable. This housing will not only prevent quick wear and tear but also ensure that the unit will provide you with a service you can depend on for many years to come. Additionally, there is the dry-fire lockout feature that prevents empty drives while preserving the life of the tool. Easy and hassle free adjustments. Over-molded handle for enhanced comfort. Clip holder tends to come loose. 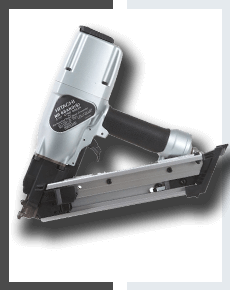 If you prefer having a cordless framing nailer, then you does not need to look, further. 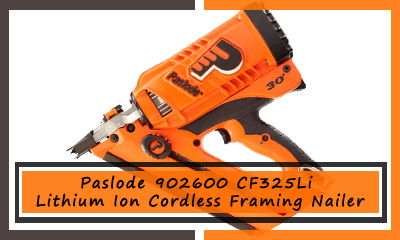 Paslode 902600 CF325 comes with all the features you need in a high performing and easy to use model. This unit will give you more freedom on the job site as it does not have any hoses or compressors. This will also mean that you have a light, portable, and easy to use framing nailer. What makes Paslode 902600 CF325 unique? One of the main advantages of selecting a power tool that uses lithium ion battery over the other batteries is that it will give you more power, meaning that you can work on a project for longer. These batteries also charge faster and retain the charge for longer. This tool does not have any hoses or compressors that make a framing nailer clumpy. Instead, it comes with a compact design that is lighter in weight allowing you to handle house-remodeling tasks efficiently. Additionally, this model comes with a compact design allowing you to work on tight areas without problems. This unit is designed with all the features that are needed when it comes to any professional framing work. These features make it possible to have the best driving of nails when compared to other models on the market. In addition, this model is constructed with high-quality materials to withstand repeated use for many years to come. Needs to recharge for you to continue with your work. 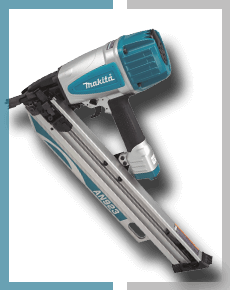 Makita is one of the popular power tool manufacturers that have been in the production of framing nailers for quite some time now. This manufacturer is known to produce high-quality tools at a reasonable price. 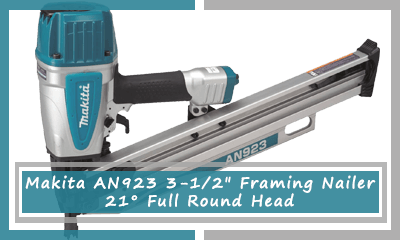 The Makita AN923 Framing nailer is another high-performing product from the manufacturer that is designed to fire nails from two to 3.5 inch sequentially or on contact with a flip of a switch. What makes Makita AN923 special? 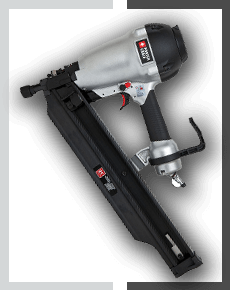 This pneumatic framing nailer comes with a larger capacity air chamber that offers more power nails ranging from a length of 2 to 3.5 inches. The increased power means that the tool will fire more nails in a minute making it a great choice for individuals who are looking for a model to use in large remodeling projects. The main advantage of selecting a lightweight framing nailer is that you can keep using it for longer without your hands becoming tired. The compact and lightweight design makes this product easy to use when trimming, making furniture, doing cabinet work and much more. This model also comes with advanced features that make it ideal for multiple types of works. Some of the features that make this model a great pick includes the built-in filters. It minimizes the dust and debris from entering the tool. The tool-less depth adjustment that is specially designed for the more precise flush as well as countersink nailing. In addition, this model comes with a Retractable hook that allows you to keep the tool close but never in the way. Easy to reset after a jam. No-mar tip protects material surface. Anti-dust cap keeps debris out. You should consider some factors when selecting the best framing nailer. You can either decide to go for a cordless or pneumatic nail gun but this will depend on your specific needs. The cordless nailers use either fuel or battery to power them while the pneumatic nail gun is powered by an air compressor. 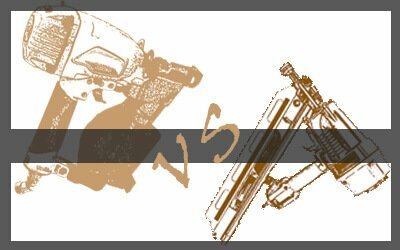 The following factors will help you to select the best framing nail gun. This is probably the most crucial factor you need to consider when selecting a framing nailer. A finish nailer that weighs less will not only be easy to work with but also allow you to work for longer since your hands will not get fatigued faster. Selecting lightweight framing nailers will also allow you to work on ceilings and other high areas. Additionally, selecting a light nailer will make it easy to transport to your job site. Comfort is also very important. A model that comes with a comfortable handle will boost the efficiency of the user. You will not also get fatigued quickly allowing you to tackle a larger area. On the other hand, a comfortable nailer will enhance your safety as it provides you with better grip, which is very helpful for easy maneuvering. Generally, comfortable and lightweight tools are great, as they feel nimble especially if you have to deal with overhead work as well as other tasks that require you to use the tool for many hours. Another crucial consideration is the type of the stick. Generally framing nailers comes in two stick types. One of the types is the coil stick while the other is a straight stick. The main difference between the coil stick and the straight one is that the coil stick will hold more nails than the straight one. The framing nail gun also comes with two different magazine types. These includes stick magazine and coil magazine. A model with stick magazine usually has a straight magazine where the nails are placed on plastic or paper collation. As previously mentioned this type of magazine will hold fewer nails making the nailer ideal for lightweight duties. Therefore, if you are looking for an inexpensive model for home use, a nailer with a stick magazine will be ideal for you. On the other hand, a coil nailer has the nails collation together with wire. This feature allows the nails to detach more easily, making this type of nailer effective for heavy application. When choosing the best framing nailers, you have to choose between two options when it comes to the power source. This is the cordless models, which are powered by fuel or battery, and the pneumatic types, which use compressed ﻿ai﻿﻿﻿r. The cordless model is great for individuals that are looking for a nailer that provides portability and versatility. This means you can work on hard to reach areas with ease. On the other hand, using the best pneumatic framing gun will be more cost effective especially when tackling a large project. They are more powerful and can be used to drive long nails through tough materials easily. Additionally, these are heavy-duty tools and can be used for a very long time without overheating. The main cons of these nailers are that they cannot be used as finish nailers as they usually work with longer nails. This means that you cannot use them to work on delicate materials. To make it easier for you to operate the framing nailer, the model you select should come with various special features that will enhance the overall productivity. Some of the crucial features that you should ensure that your model has to include Depth adjustment, swiveling air connectors as well as quick jam clearance. The depth adjustment feature will help you when selecting the depth that you will want to drive your nails. This feature is also useful, especially when handling woods that have varying thickness. Additionally, the quick jam clearance tool is crucial for helping you to clear the jam. This feature will save you a lot of frustration and time. We cannot dispute that there are many entry products from less known brands that are doing well. However, most of the less known brands have a reputation of constructing weaker products that fall apart soon after you start using them. On the other hand, the trusted brands tend to keep their word and continue producing high-quality products that are not only effective but also durable. 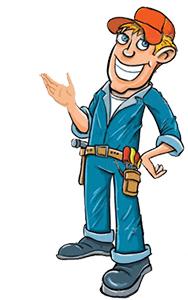 One of the best ways of finding a reliable nailer is to look at the customer reviews. This will let you know how the product performs and how it feels in your hand. Some customer feedback will also tell you whether the product is worth the price. Some of the trusted brands is Dewalt, which has been in the production of power tools for more than three decades. 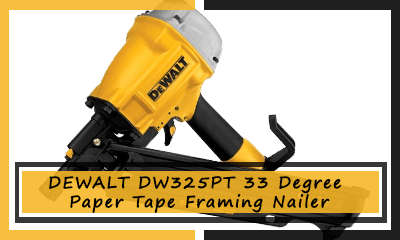 Selecting Dewalt framing nailer is a great idea if you are looking for a model to give you a service you can depend on for many years to come. Another crucial consideration is the design of the nailer. The best framing nailer should come with a compact design to make it easy to maneuver even in tight spaces. Another benefit of selecting a compact framing nailer is that it is easy to store. This model will fit in your tool cabinet easily, meaning that you do not have to look for any other storage space. On the other hand, you need to consider the safety. Ensure that the product comes with protective guides as they help in shielding you from any frying debris. Ensure that you look at the safety features that come with your product before making your selection.